When you look at your 3-year-old child running and climbing it’s hard to remember that just a short time ago she was a tiny baby in your arms! Since her birth, your child has soaked up all the words she has heard spoken, sung, and read aloud to her. Now she has more of the words she needs to tell you how she is feeling and to describe the wonder of the world she encounters every day. Your 3 year old has his own opinions and is becoming more independent. He can imagine, and even though he is still the center of his own world, he is starting to understand that other people have different ideas and feelings than he does. He may even be able to take turns and share toys! What should you read aloud to this newly confident, yet still dependent child? 3 year olds have a longer attention span and can listen to books with more words. They also appreciate stories that are silly and make them laugh. Since your 3 year old is busy and on the go, read when there is a natural break in your child’s activity, such as during snack time, bedtime, or during a bath. Reading aloud is a great way to unwind and refocus a child’s energy. Ask lots of questions about the story and the pictures so your child can develop his or her curiosity and keep building vocabulary. “Pete’s a Pizza,” by William Steig. Pete’s mom and dad make him into a pretend pizza with some things they find around the house. Do this at home for loads of giggles! “Yoko,” by Rosemary Wells. When Yoko starts school she is the only one who brings sushi for lunch. What will the other children say? “Are You My Mother?” by P.D. Eastman. A baby bird hatches and finds his mother isn’t in the nest, so he starts on an adventure to find her, making many unintentionally silly mistakes along the way. “The Doorbell Rang” by Pat Hutchins. Grandma makes cookies, but then friends come to visit. Will there be enough for everyone? “The Salamander Room” by Ann Mazer, illustrated by Steve Johnson and Lou Francher. A boy finds a salamander and his imagination turns his whole bedroom into a woodland paradise for his new friend. “Owl Babies” by Martin Waddell, illustrated by Patrick Benson. Three baby owls are left in their nest while their mother goes off to find food. Will she ever come back? The end of the story is reassuring. “Lyle, Lyle the Crocodile,” by Bernard Waber. This series of books about a lovable crocodile who lives in an apartment on East 88th Street in New York City is filled with many occasions that need creative problem solving and end up in fun. Where do you go to work, Mommy? What do you do at work, Daddy? Picture books can help explain the adult, working world to young children and prompt them to think about the perennial question, “What do you want to be when you grow up?” There are both books that are filled with photographs and straightforward facts about different occupations, and books that are stories made up of dramatic interpretations of various work situations. Try both styles and see which one your child enjoys most. As grown-ups we know that a person can have many interests and jobs in a lifetime. Read aloud with your child to explore the possibilities. Each book is a conversation starter. You can talk about people you know with different professions and your child’s own dreams about what the future holds. To extend a book further, visit the businesses you read about. Read a book about a police officer, then get a tour of the police station. Read about farming, then visit a farm and see the animals that live there. Ask your grocery store or local bakery if your child can have a special tour after you read about those things. Your child will learn new words and ideas and remember them better when you connect the book’s words to the real world. 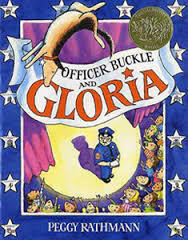 “Officer Buckle and Gloria” by Peggy Rathmann, is a humorous story about a police officer and his companion at work, a dog named Gloria. The officer’s job is teaching children at a school about safety, but he puts the students to sleep with his talks until Gloria comes to the rescue. “New York’s Bravest” by Mary Pope Osborne, illustrated by Steve Johnson and Lou Fancher, is a folktale about Mose Humphreys, a firefighter in New York City in the 1840s. The qualities of all firefighters are exemplified in this giant of a man, who is a brave and selfless hero. “Pig Pig Gets a Job” by David McPhail will tickle the funny bone of your pre-schooler. Pig Pig has grand ideas about jobs he could do, but his mother scales down his wild plans to make them practical. “Kitten Red, Yellow, Blue” by Peter Catalanotto teaches numbers, colors, and professions, as sixteen calico kittens each find their niche in life. “Whose Hat is This?” by Sharon Katz Cooper, illustrated by Amy Bailey Muehlenhardt, will keep your children guessing–and learning–about all the things people do for work. Other books in the series explore jobs that use different tools and vehicles. “Where’s Our Mama?” by Diane Goode is the story of two children looking for their mother with the help of an officer at a Paris train station. Although the professions of the eight women the children meet isn’t named, there is plenty of opportunity to talk about what jobs the women are doing. The text of each page is a teaser for the picture on the next page. “I Want to Be…” series by Stephanie Maze is made of books filled with photos of real people going about their workdays. You can read about the day of a veterinarian, engineer, astronaut, dancer, chef and many other professionals. If the text is too long for your young child, you can talk about the pictures.